A report from the front-lines of the climate change movement. 350.org’s #DoTheMath was described by 350 National Coordinator Joshua Kahn Russell as a “back-to-back-to-back-to-back” tour of major cities and college campuses across the country to evangelize people around the fight to save the Earth from an impending depletion. On November 16 the tour took over New York City's Hammerstein Ballroom for an evening of talks, conversations, music, video, exhortations and promises to start taking a more militant stand in the efforts to halt climate change. The keynote speakers ranged in age, experience and perspective: Bill McKibben [whose Rolling Stone article “Global Warming's Terrifying New Math” had 10 times as many likes as the article published in the same issue about Justin Bieber], Nation columnist Naomi Klein author of Shock Doctrine, Josh Fox, one of the director of the award-winning documentary, Gasland, and DJ Spooky as well as Van Jones via steaming video, who talked about how erratic weather patterns caused by climate change disproportionately affects black and brown people in the global south. As Tom Zeller pointed out recently for Huffington Post, the camaign is a way to underscore and understand the terrifying math that needs to be grappled with: “565 and 2,795. The former is the upper limit, in gigatons, of carbon dioxide that many scientists believe humanity can still dump into the atmosphere while managing to avoid the 2 degree uptick in global temperatures that would be disastrous to humandkind. The latter refers to the amount of carbon dioxide that fossil fuel companies currently possess and are seemingly ready to exploit for profit. The dynamic speakers gave way to an unusual event that went well beyond the lecture series that many in the audience were expecting to a night filled with music, laughter and talk of movement-building. Paul D. Miller, aka “DJ Spooky” continued on the theme of numerical patterns by performing parts of his project “Artic Notes” where he took algorithms found in weather patterns over the past few decades and used them to design beats. Miller also gave a brief presentation outlining his inspirations which included photos of a recent trip to the North Pole he took to a synopsis of a Johnannes Kepler's essay “Six Sides of a Snowflake”. Klein spoke strongly about a movement that encouraged her own politicization. The first protest she ever attended was an anti-Apartheid demonstration on her campus during the late 1980s–outlining that #DoTheMath is calling for the next anti-Apartheid movement pulling in participation from everybody from college students, to global leaders, in order to build a mass boycott campaign with the capacity to force fossil fuel companies into the status of “social pariah” that Big Tobacco companies came to eventually occupy in this country. The ultimate push during the event was to gain mass buy-in from the audience to launching a campaign utilizing the model of the anti-Apartheid movement in South Africa by targeting fossil fuel companies via divestment campaigns that target college campuses as well as harnessing solidarity from across the globe to pressure our country to close legislative loopholes that give multinational corporations a dispropriate say in politics. Klein and McKibben made clear that not only are 350.org and affiliate organizations “getting serious” but they are prepared to put their bodies on the line through direct action-oriented civil disobedience on college campuses, in Washington and in direct confrontation with companies like Exxon–whose corporate office in New York City was literally around the corner from the event venue. The goals are no less than a freeze on new fossil fuel investments and the winding down of all existing fossil fuel investments. McKibben eventually made his “big ask”, asking all students and alumnus in the room to stand up who were willing to march on their college campuses or occupy Dean’s offices demanding that their administrations divest from fossil fuels drawing attention to their institutions complacency in climate change. 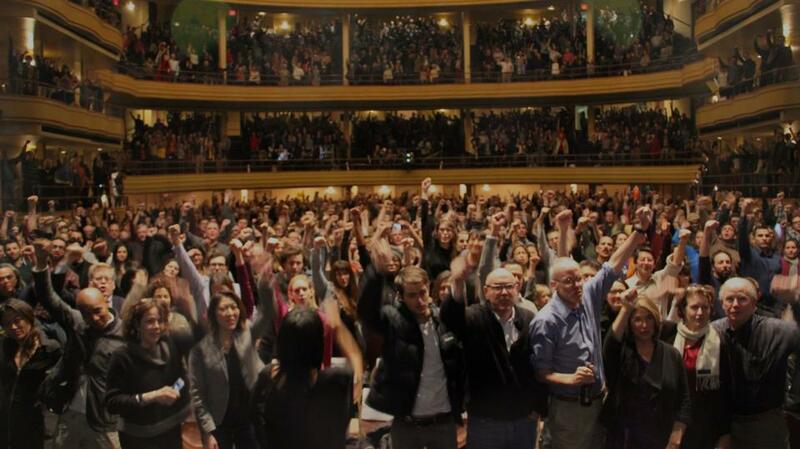 The majority of the audience stood up during the event to pledge their commitment to the task at hand. Finally, McKibben asked who from New York was willing to march on the Exxon building around the corner from Hammerstein Ballroom in coming months–and the entire room pushed back their chairs and stood up. Looking around the room in awe, I couldn’t help but be overwhelmingly disappointed that 80-90% of the attendees in the room were white, middle-class people — not the people most affected by climate change. This underscored for me how absolutely critical it is to “connect the dots” between global poverty, climate change and institutional racism. Without reframing the mis-understanding of environmental movements as a majority white-led, pet-projects, it'll be difficult to emphasize the importance of amplifying the voices of those who are most affected by climate change across the world. And without those voices, we will lose.